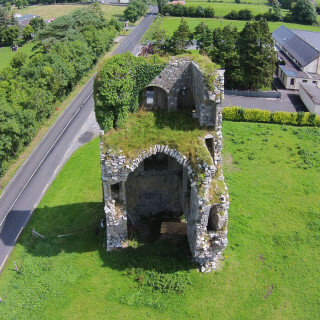 Galey Castle is located at Galey Bay on the West Coast of Lough Ree in County Roscommon and was the former stronghold of the O’Kelly Clan. All that remains of the 16th Century Tower House, built on the remains of the Kelly foundations, are one of the gable ends and some ground works. Barnaderg (Irish: Bearna Dhearg, meaning “red gap”)is a village northeast of Tuam in eastern County Galway, Ireland. 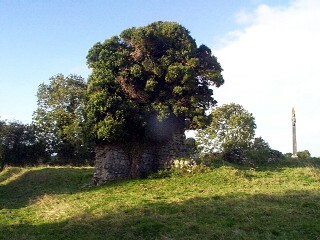 Barnaderg Castle was a 16th century stronghold of the O’Kelly clan. Monivea Castle was built c1600 by the O’Kelly clan. Patrick Fitzrobert French, purchased Monivea Castle and estate in 1609 from John Crosach O’Kelly. Monivea Castle and the Frrench Mausoleum within Monivea Demesne are protected structures. Monivea Castle was inhabited until the middle of the 20th century. 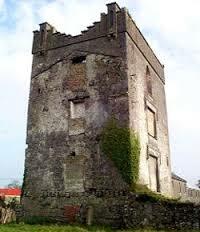 Garbally Castle, in the parish of Skehana, County Galway, was a 15th century tower house of the O’Kelly clan. It was build in 1499 by Malachy O’Kelly, later demolished by the troops of Oliver Cromwell and never repaired after that. Initially the castle was destroyed by MacWilliam De Burgo in 1504, however Samuel Lewis 1832 notes that it was “partially destroyed by Cromwell” along with the nearby castle of Clooncureen in the 17th century. The building is now in ruins with only the NE section remaining. In olden times the strong and ancient Castle of Aughrim belonged to a junior branch of the O’Kelly’s Chiefs of Hy-Many, descended from William, the ninth son of Macleachlainn (Malachy) O’ Kelly, chief of territory for twenty six years, who died in 1401. It is recorded that William O’ Kelly, lord of Hy Many, patron of the O’Duigennans, extolled as the man of greatest character, worth and renown of his own tribe, invited all Irish poets, brehons, bards, harpers, with the gamesters and jesters, the learned, the travellers, and the poor to his house for Christmas, where all, noble and ignoble, were served to their satisfaction, so that they were all thankful to him and sang songs to his praise – “the Poets of Erin to one House”. 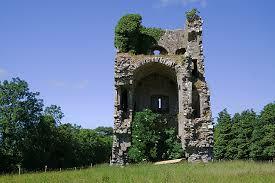 Garbally Castle, in the parish of Skehana, County Galway, was a 15th century tower house of the O’Kelly clan. It was build in 1499 by Malachy O’Kelly, later demolished by the troops of Oliver Cromwell and never repaired after that. Initially the castle was destroyed by MacWilliam De Burgo in 1504, however Samuel Lewis 1832 notes that it was “partially destroyed by Cromwell” along with the nearby castle of Clooncureen in the 17th century. It’s at the junction with the R339. 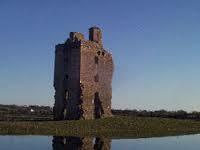 The castle was built in the 15th or 15th century by Malachy O’Kelly along with other fortifications in the area. The Kelly Clan was well known at the time for their skill in building strongholds. Unfortunately this castle was destroyed in 1504 by MacWilliam de Burgo who also destroyed the castles at Monivea and Gallagh. Garbally castle was probably later rebuilt since some records say that Cromwell and his army partially destroyed Garbally castle again in the mid-17th century along with castle at Clooncureen. What we see today is a mostly ruined castle with its interiors exposed. It’s a three-storey tower about square in plan. The southwest side is the most damaged and shows thick side walls with mural passages and a vaulted ceiling on the first floor. In the southeast wall there’s a pointed arch doorway which is defended by a gun loop in the south jamb and by a murder-hole. The top of the northeast and southeast walls still have the corbels for the machicolations. The northeast wall has some windows, three of which are slits. On this same side a handball alley has been built. This is one of the several monuments in Ireland that has been disfigured with the construction of a handball alley. This page was added on 08/09/2014. It wasn’t William O’Kelly (generation 30 from Maine Mor) the 9th son of Macleachlainn (generation 29) which was known for his hospitality in Aughrim, but his grandfather William Bui O’Kelly (generation 28). 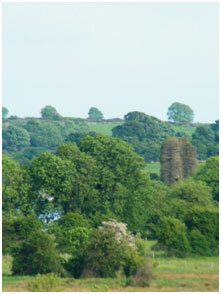 The feast was hosted at Galey castle in Roscommon and last 30 days. It was after him who William the 9th son was named for. A great landmark that must have been a great building in it’s day. I guess the roadways were just tracks when construction was made.